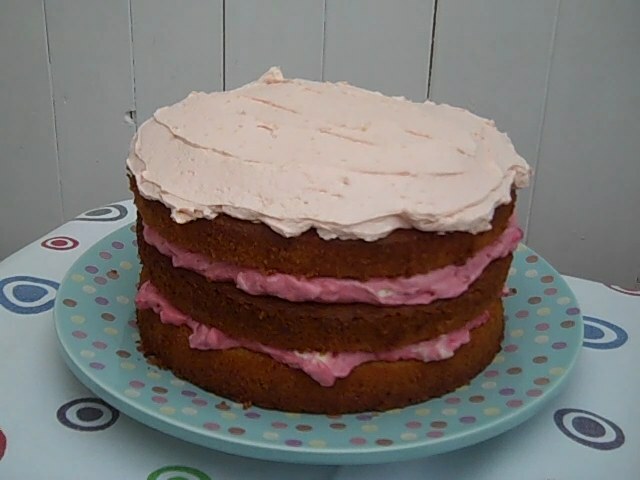 This is a really indulgent cake and would be perfect for Mother’s Day or other special occasions. Pre heat oven to 160C/gas 4. Grease and line 3 18cm cake tins. Beat the butter and sugar until light and fluffy. Beat in the eggs, one at a time, then fold in the flour, almonds, baking powder and lemon zest (if the mixture feels too thick, add a splash of milk – it should fall off a spoon when tapped). Divide the mixture evenly between the three cake tins and bake for 25 minutes or until a skewer inserted into the cake comes out clean, Turn onto a wire rack to cool. To make the filling, beat the mascarpone with the cream and icing sugar until stiff enough to just hold it’s shape. Fold in the raspberries and set aside. For the icing, beat the butter and icing sugar in a bowl until light and fluffy. Add the lemon zest, milk and few drops of pink food colouring, until the desired shade of colour is reached. To assemble, put one sponge on a serving plate and spread with half the filling mixture. Top with the second sponge and repeat with the remaining filling mixture. Top with the third sponge. Usig a spatula, spread the frosting over the cake.